On a cool winter day in the city of Dara'a, a young man walking by me on a busy commercial street grazed me gently. In any large city outside Syria, it would have gone unnoticed. But as I made eye contact with the young man, he gestured with his head to follow him in between two buildings. I quickly sensed that the nudge was not accidental. I had been standing on the busy street filming with my cameraman as part of a government-sanctioned tour of the restive city where Syria's uprising began. Shops were open, traffic flowed and people hurried about their business. There was a sense of normality to the street  until, that is, I followed the young man into the alleyway. "Nothing is what it seems," he said. "This is what they want you to see so you think everything is normal." The young man began speaking at a dizzying pace, describing for me the horrors of what happened and is happening in this city, including daily raids of resident homes, ubiquitous security checkpoints and crackdowns on dissent. He lifted his shirt to show me gunshot wounds he said he suffered during the crackdown on Dara'a. "Come back after a few hours and see what happens in Dara'a after it gets dark," he said. As he pulled his shirt back down, he looked at me squarely and said, "The only gangs in these cities are the armed gangs that belong to Assad ... Only the Free Syrian Army [a loose-knit group of fighters made up of military defectors and their antigovernment supporters] will protect us and will not stop until the regime falls." As quickly as the conversation began, it ended. I was back on the street, in the company of the government minders, off to our next stop. Earlier in the day, a group of journalists had been taken to meet the governor of Dara'a, Mohammed Khaled al-Hannus. Ironically, his message was very similar to what the young man on the street would tell me a few hours later. "The situation in Dara'a and Syria is not what you see on TV," he said. "Three-quarters of our problem come from al-Jazeera and satellite channels exaggerating what is happening. Today, you will go out and see for yourself what Dara'a is like." According to al-Hannus, and by extension the Syrian government, what began as a legitimate protest against corruption and political stagnation last March was addressed and resolved with "respectable residents." Those in the streets today "are armed gangs and terrorists" and not the same as those who originally took to the streets: "They are bought with money and drugs." Once again, the reality in the country depended on whom you asked. In Syria, there are concerns that the protracted conflict has become a battle over perception as much as a battle for the future of the country. Each side claims a monopoly on the truth, making it harder for everyone to really understand what is happening on the ground, especially journalists relying on unverifiable amateur footage from inside the country, government-escorted minders on the other side, statements from exiled opposition members and Syrian government officials who rarely grant journalists interviews. On the streets of Damascus, the capital, many supporters of President Bashir Assad have decided whom to blame for the recent unrest: Qatar and Arab Gulf countries, whom they accuse of inciting violence to weaken and divide Syria. At progovernment rallies, Syrians say Gulf Arab countries take orders from the U.S. and Israel to weaken the alliance of Iran, Syria and Hizballah. Their argument goes that because Syria dares to stand up to the U.S. while supporting resistance to Israel's occupation of Arab lands, a conspiracy has been hatched with the support of foreign media to topple Assad's pan-Arab nationalist regime. Had Gulf Arab countries been genuine about reform and democracy, they would have been more vocal about countries like Bahrain, where a reform movement was crushed militarily. It's a different story in parts of the country where antigovernment sentiment runs high. Their struggle, the oppositionists say, is for freedom from oppression and tyranny. Popular unrest is the same as it was in other Arab countries that have fought to end one-family rule and dictatorships. Opposition forces inside Syria say the crackdown by pro-Assad forces and "gangs" is the work of foreign hands too. But the foreign hands are Iran and its Lebanese ally Hizballah, wanting to preserve their patron in Damascus. In Zabadani, a Syrian town that is nestled along the Lebanese-Syrian border, members of the aforementioned Free Syrian Army openly profess their disdain for Hizballah and Iran. When I visited the town with Arab League monitors, the city was swept up in a hysterical frenzy over rumors that Hizballah had amassed fighters on the Lebanese side of the border to coordinate a joint attack with the Syrian military against Zabadani. Hizballah denied the charges. Syrian activists inside the country have recently been circulating amateur footage of what they claim are Iranian forces captured while operating inside Syria. A member of the Iranian parliament who chairs the security and foreign policy committee in the legislature described 11 missing Iranian nationals as religious pilgrims, further sowing confusion over what is fact and what is fiction. The U.S. has accused Iran of supporting the government in Damascus, saying high-ranking Iranian military officials have visited Syria in recent weeks. Iran has reiterated its support for Assad's government. According to the nation's official news agency, Iranian officials say Assad still has the majority of support in his country and that Tehran stands by the President's reform plans against what it calls "terrorists attacking the central government." 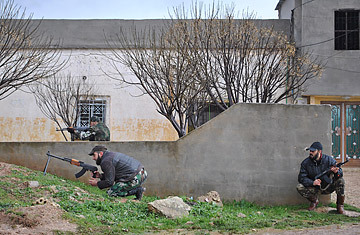 The Syrian government claims weapons are being smuggled in from Turkey and Jordan to arm rebel fighters attacking the state. Gulf Arab countries are financing the Free Syrian Army. Meanwhile, the Syrian opposition has repeatedly criticized the Arab League and the West for not intervening more to stop the bloodshed. They call on the United Nations Security Council powers to impose tougher sanctions on Syria and have openly called for military intervention, including the imposition of no-fly zones or safe zones and humanitarian corridors that would restrict the movement of the Syrian military inside the country. Syria's main ally, Russia, has also been involved in the media blame game. According to a pro-Assad satellite channel, Russian Foreign Minister Sergei Lavrov has blamed members of the U.N. Security Council for fueling the divisions in Syria by not exerting more pressure on the opposition movement known as the Syrian National Council to enter direct negotiations with the Assad government to resolve the conflict. The media in Syria have become vital tools in the battle for the country. Progovernment channels dedicate considerable resources and airtime to scrutinizing amateur cell-phone footage used and circulated globally via the Internet by opposition protesters, trying to undermine their reports of atrocities and massacres. They also dissect foreign news bulletins, looking for errors and biases they say are evidence of a foreign conspiracy against them. As the conflict drags on and becomes increasingly militarized, many people feel that the wounds of a full-blown war between the government and armed insurgents would destroy Syria, and that fear has paralyzed some into supporting the President  for the time being. It is difficult to gauge how much support the President or his policies actually have. Syrians I spoke to have expressed support for the regime out of fear of the alternative. They don't know what a post-Assad Syria would look or function like. Many of those I spoke to blame the Syrian opposition for not doing a better job of communicating their vision for the day after. For now, foreign journalists inside Syria are under restrictions as to where they can go in the country, though more and more, they are pushing the limits  at great personal risk  by venturing out without the permission or the presence of government minders. The government says restricting the movement of journalists is for their safety. Critics say it's to control the message. Unlike the Arab revolutions in Egypt, Tunisia and Libya where critical masses quickly and overwhelmingly exposed the unpopularity of their regimes, the battle for the hearts and minds of Syrians and those watching the uprising from afar still rages, just like the 10-month conflict itself. Mohyeldin is a foreign correspondent for NBC News based in Cairo.